Pleasantville, New York: Reader's Digest, 1982. Sixth printing, 1982. Top spine end lightly bumped. 504 pages in fine condition! Embroidery, Quilting, Rug-making, Needlepoint, Patcfhwork, Lacework, Knitting, Macrame, Applique, Crochet- Step-by-step ideas and instructions, illustrations. This book has it all!. Hard Cover- Decorative Boards. Fine/No Jacket. 10 Inches Wide x 8 3/4 Inches Tall. New York: Smithmark Publishers, 1992. Green cloth binding . Dust Jacket Mylar protected. Great Wreath Ideas is dedicated to creative wreaths and to creative wreath making. Included is an explanation of the basic wreath bases, the tools needed, and the techniques involved, as well as a discussion on gathering materials and drying flowers.. Cloth. New/New. New York, New York, U.S.A.: Readers Digest, 1997. This beautifully illustrated and fascinating book reveals how easily you can grow pumpkins and squashes for either culinary or ornamental use. 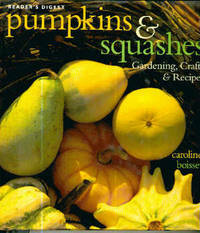 It also includes more than 60 superb recipes and an illustrated directory of pumpkins and squashes. 120 pages. Gift Quality.. Hard Cover- Decorative Boards. As New/As New. 9 3/4" X 9 1/2". Alabama: Oxmoor House, 1986. Deck your halls, your doors, your mantels, your tabletops with these distinctively original designs. Help Santa fill his pack with bundles of homemade, handmade happiness...A huggable Santa doll, adorable sock babies, whimsical holly bears, lion scubbers for babies at bathtime or a soft, cuddly teddy comforter. 159 pages of creative ideas, and patterns. The Dust Jacket has a couple of short tears, but is now Brodart protected.. First Edition. Cloth. Fine/Very Good. Illus. by Photographers: Jim Bathie, Beth Maynor, Courtland W. Richards, Sylvia Martin, Gary Clark, Katherine Adams. 4to - over 9¾" - 12" tall. 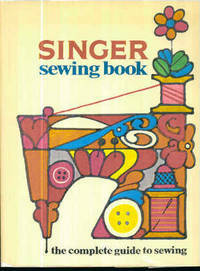 USA: The Singer Company, 1969. Eighth Printing. Tan cloth with gilt lettering and sewing machine design on front. The Dust Jacket (now Brodart Protected) has 1/2 inch chipped from bottom spine and a couple of short closed tears and is age toned. With the exception of a couple of minor stains to bottom page edges near spine, the 428 pages are in fine, tight, unmarked condition. 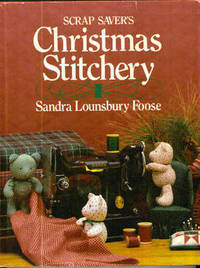 Many Color Plates and Line drawings enhance this most complete sewing instruction book, with over 1500 color illustrations dramatizing every step for Button Holes, Linings, Interlinings, Interfacings, Tailoring, Zippers, Hems, Belts, Pleats, Fabrics, Hand Sewing, Machine Sewing, Blanket Stitch, Chain Stitch, Sleeve Construction. First Edition. Cloth. Near Fine/Good. Illus. by Jacket Design - Ralph Castenir, Book Design, Art Direction and Production Supervision - Claire F. Valentine. 4to - over 9¾" - 12" tall.